that represents the area subtended by the PV curve. WOB can be expressed in power (per unit of time) or per liter of ventilation (J/L). The relationship between work and minute volume, however, is usually nonlinear. Because the reduction of excessive patient WOB due to abnormal respiratory mechanics is a major goal of mechanical ventilation, measurement of WOB is of substantial interest in ventilator-dependent patients. However, the technique can be invasive and is not adequately standardized. Figure 4. 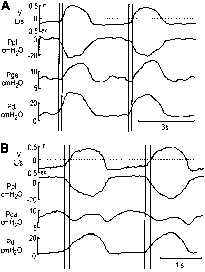 Experimental record illustrating the method used to determine the level of dynamic intrinsic PEEP (PEEPi,dyn) during spontaneous un-occluded breathing efforts in a representative patient with active expiratory muscles. From top to bottom, tracings represent flow (V), pleural pressure (Ppl), gastric pressure (Pga), and trans-diaphragmatic pressure (Pdi). The first vertical line indicates the point corresponding to the onset of the inspiratory effort (Pdi swing). The second vertical line indicates the point corresponding to the start of the inspiratory flow. The dotted horizontal line represents zero flow. in = inspiratory flow; ex = expiratory flow. (A) Tidal volume = 0.46 L. Note that expiratory flow ends abruptly before inspiration, whereas the Pdi and Ppl swings have already begun and Pga has remained constant during that interval. In this case PEEPi,dyn was measured as the negative deflection in Ppl between the point corresponding to the onset of the Pdi swing and the point of zero flow. (B) Tidal volume = 0.33 L. Note that Pga increases throughout most of the expiration. By contrast, Pga becomes less positive from the onset of the inspiratory effort indicated by the start of positive Pdi swing to the start of inspiratory flow. In this case PEEPi,dyn was measured as the negative Ppl deflection between the point corresponding to the onset of the Pdi swing and the point of zero flow subtracted by the amount of Pga negative deflection observed in that interval. 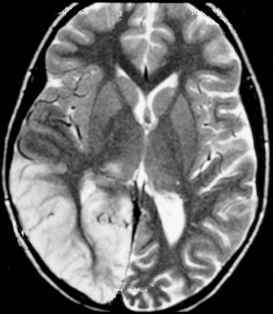 Reprinted by permission from Reference 94.
coworkers (49, 50) and Ward and coworkers (53), the patient's WOB can be estimated noninvasively by comparing the pressure-volume (or pressure-time) relationship with that during CMV. Differences in WOB among patients, even in the same patient under different circumstances, may be used to compare the effects of the ventilatory settings, particularly volume and flow, the internal diameter of the endotracheal tube, the ventilator devices, or for evaluation of a patient's response to therapy, such as bronchodilators (93, 130-132). During assisted modes of ventilation, a patient's WOB can be measured with the esophageal balloon-catheter technique using the Campbell diagram (Figure 5), which also allows partitioning between elastic and resistive work, and the detection of expiratory muscle activity. The presence of a positive alveolar pressure at end-expiration (i.e., intrinsic PEEPi) can considerably increase the area enclosed in the loop and involve supplemental "elastic" work. Measurement of WOB may help in deciding an appropriate level or type of ventilator assistance and avoid both excessive and insufficient support. For instance, continuous flow systems seem to offer less resistance to breathing than demand flow (i.e., pressure-triggered) systems and can decrease a patient's WOB (86, 93, 133-135) (see Assessment of the Function of the Active Chest Wall: Campbell Diagram in Section 6 of this Statement). There is little doubt that measurement of WOB could be useful in many clinical conditions in ventilator-dependent patients. Automatic systems for its measurement are now available (99, 136-138). However, the superiority of the measurement of WOB, over more simple monitoring, for example over P0.1 (56, 74) or breathing pattern (13), has not been proved (76). The esophageal balloon technique is unlikely to be used routinely for monitoring the magnitude of inspiratory effort and WOB. Whether measurements of Ppl could improve useful clinical-decision making and patient management in certain situations, such as the difficult-to-wean patient or the patient who unexpectedly "fights the ventilator (Figure 6)," remains to be determined.